Hong Kong, 30 November 2018 – Marchance Auctioneers Autumn Auctions 2018 held on 28-29 November 2018 presenting over 700 pieces of items achieved landmark success with a record HK$ 100 million (including buyer premium), twice as the auction house’s 2017 Autumn Auctions. The total transaction value of 2018 has been brought to an impressive HK$ 177.5 million, the highest annual result at Marchance with a 248% increase from 2017. 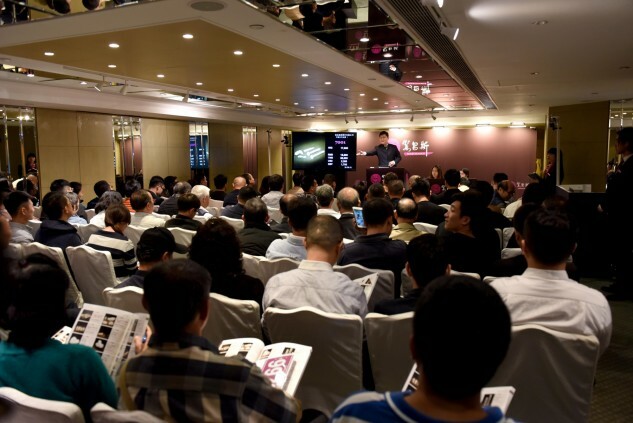 The two-day autumn auctions saw 9 items sold for over millions of Hong Kong dollars each, marking three years of continuous growth and an important milestone for Marchance on its fifth anniversary. 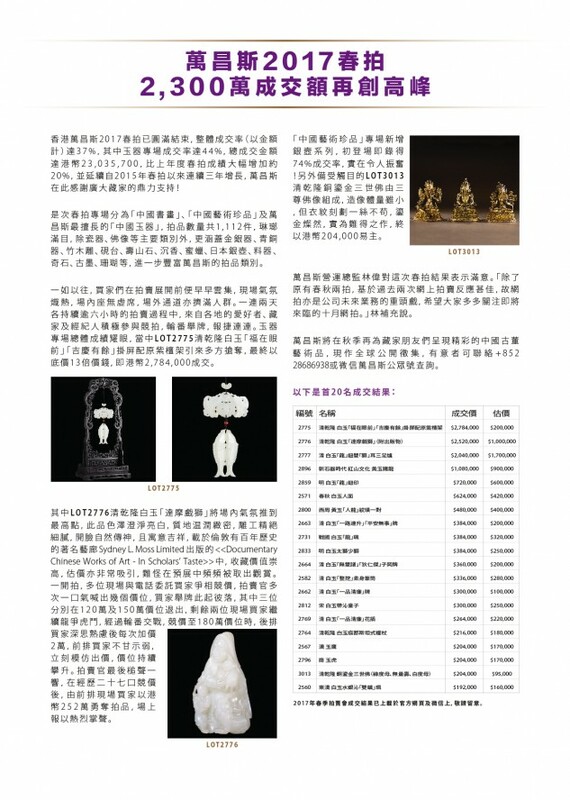 The auction house also achieved impressive performances in the three remaining sales, Fine Chinese Paintings & Calligraphy and the new sale Magnificent Jewels and Jadeite, recording HK$ 32.31 million, HK$ 2.1 million and HK$ 14 million respectively. “Marchance has had an amazing five years in Hong Kong. 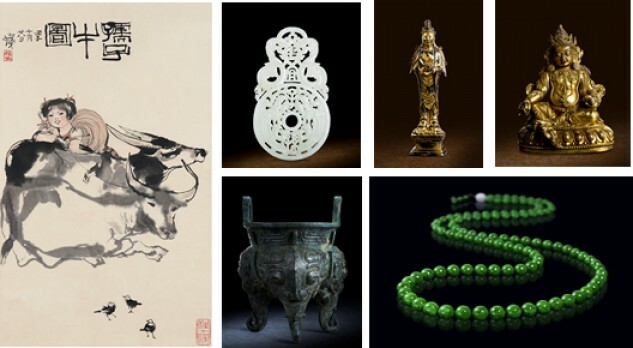 As the market stepped into stable and rational, the autumn auctions served as a testament to Marchance’s leading and solid position in the ancient jade market and has recorded remarkable success in diversified sectors including Buddhist art and ceramics. The enthusiasm of our clients, and the transaction values from the autumn auctions have broken records and reflect our passion for cultural heritage and providing a service that is professional and authentic to its core. This fifth anniversary is an important milestone for us and reinforces our mission to integrate art into daily lives.” Said Mr. Lam Wai. 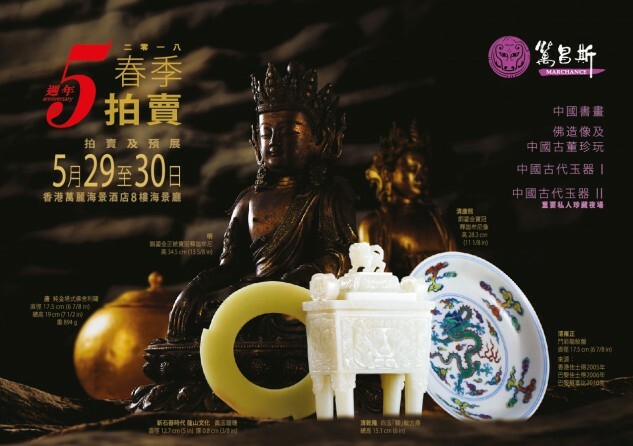 Marchance Auctioneers, Hong Kong’s first auction house to specialize in ancient jade, proudly announces the upcoming 2018 Autumn Auctions to be held from 27 to 29 November at Renaissance Harbour View Hotel Hong Kong. The sales will present more than 700 art pieces assembled from around the world, showcasing the treasure of Chinese history, culture and art with 5 auction series: Ancient Chinese Jade I, Ancient Chinese Jade II • The Evening Sale of Important Private Collections, Fine Chinese Paintings and Calligraphy, Important Buddhist Figures and Chinese Works of Arts, and a new session - Magnificent Jewels and Jadeite. For highlights and full release please click here. 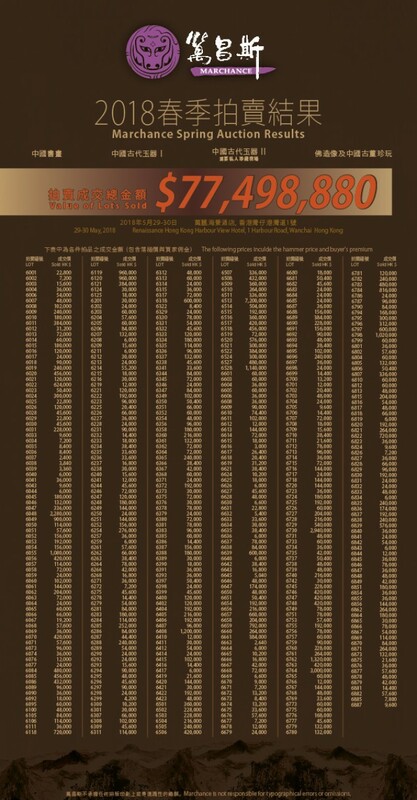 Earlier this year in May, Marchance Auctioneers Spring Auctions 2018 achieved landmark success HK$ 77.49 million, a 60% increase from our Autumn Auctions 2017. 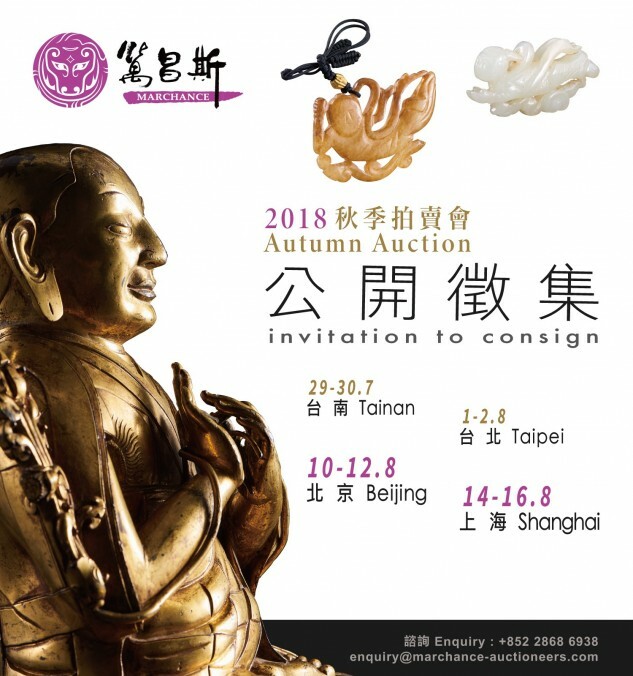 On 27-29 Nov, we will bring our Autumn Auctions 2018 to Renaissance Harbour View Hotel Hong Kong, marking the 5th anniversary. Marchance's specialists will embark on a consignment tour starting with Tainan on 29 July. To find out what your collection is worth at auction, please make an appointment for a free and confidential appraisal. We accept ancient jade, Chinese painting and calligraphy, ceramics and works of art, jewellery and watches, coins, banknotes and stamps, tea, wine and agarwood. 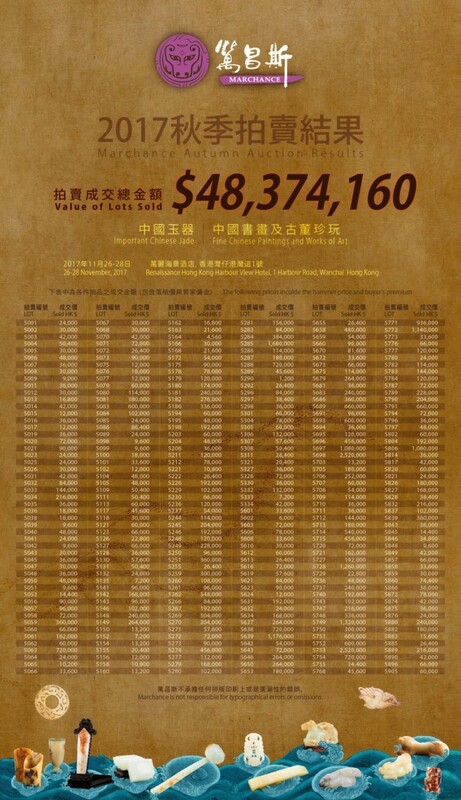 Marchance Auctioneers Spring Auctions 2018 held on May 30 2018 achieved landmark success with a record HK$ 77.49 million transaction value (including buyer commission), a 60% increase from the auction house’s Autumn 2017 auctions. 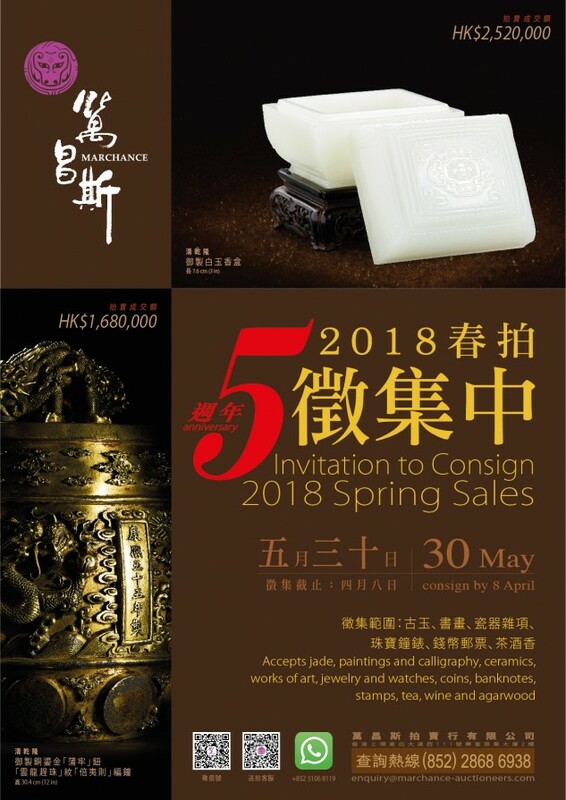 The two-day preview led up to the auctions, which saw nine items sold for over millions of dollars each, marking three years of continuous growth for the spring event, and an important milestone for Marchance on the occasion of its fifth anniversary. 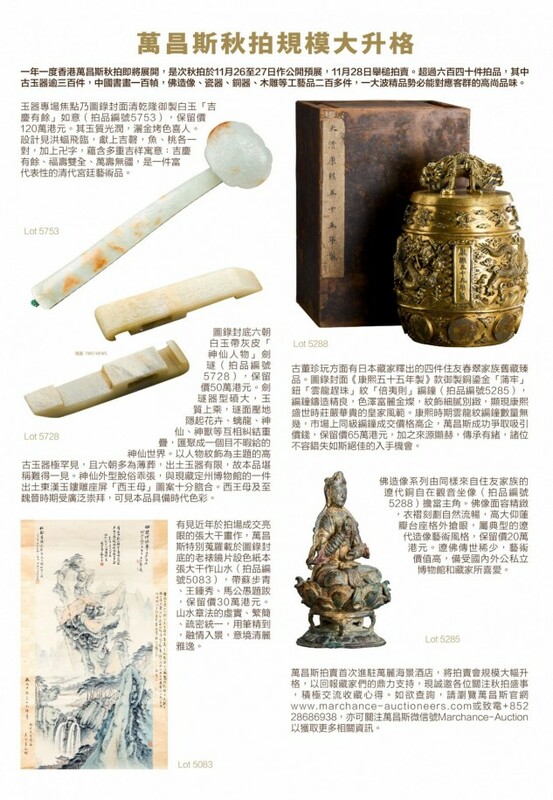 Marchance's consignment includes the following categories: Ancient Chinese jade, Chinee Painting and Calligraphy, Chinese ceramics, Buddhist Figure, Ancient Chinese Bronze, Porcelain, Lacquer, Gold and Silver Wares, Teapots, Seal Art, Stamps, Coins, Tea, Wine, Agarwood, Watches and Jewelry.